First time, fault reported (I think it was on 05.03) and repair completed early afternoon of 07.03. This time, fault detected 20.03 and reported around 16:00... Openreach visited next morning, determined problems with some of the pairs back to the cabinet (there are several blocks of flats, so high number of properties between here and cabinet, and lines are aluminium, plus a lot have broken where the cabling does a 90 degree turn from side road into main road. Engineer returned on Saturday, told me there was a new copper cable (presumable 100+ pairs) so they'd need to switch me to that once it is available. Seems that Openreach have been back today (I wasn't available, had voicemail from Post Office at about 16:00 saying I'd be reconnected on 06.04... a full 2 weeks after the nominal "3 working days to be repaired", so wonder whether anyone has had compensation paid out by Post Office for no service for 2 weeks? Currently getting 6 months broadband free (as an offer to a new customer), and paid line rental in advance, so don't expect any fresh charges until end of June (for broadband during July), and looking to find out what compensation is paid out by Openreach (so I have the info to hand before asking Post Office). I know the broadband is bought in from TalkTalk, and guessing that it's all done by TalkTalk but with call centre staff either from Post Office or TT (with the necessary Post Office greeting etc) handling all the queries. Your ISP (or their subcontractor) has a contract with Openreach and is likely to be owed any tortious duty of care by Openreach that exists in respect of maintaining service. It is your contract with your ISP and any tortious duty of care your ISP owes you in respect of maintaining service that determines your entitlement to compensation. In practice, it is likely to be contract rather than tort that determines your entitlement to compensation. Accordingly, you get whatever compensation you are entitled to under your contract with your ISP, plus whatever you can persuade your ISP to give you as a gesture of goodwill. What compensation, if any, your ISP gets from Openreach does not speak to your entitlement to compensation. Thanks. I've now checked with the Post Office and their 'compensation' is nil, they simply calculate what they would had charged for the days without service and apply that to what is owed in future. I'm not especially happy, having had information on the other topic thread that Openreach pays out 7.58 (ie a month's line rental) per day of delay in repair (compared in my case with perhaps 30p 'credit'). However, when I spoke to someone at Post Office Telecoms they were unaware of that (unsurprisingly, given it is not Openreach that Post Office deals with, I believe, but TalkTalk). Thanks for your comments. In essence the same was indicated elsewhere, and while I know that what Openreach pays out may have no bearing in what my ISP does, I may be able to shame them into a goodwill amount (and ensure they renegotiate, with TalkTalk, or are at least aware of the arrangement TT and Openreach has). You never know, they might be able to get TT to pass on compensation to them (and thence to their customer), which is only fair, after all! I'm not especially happy, having had information on the other topic thread that Openreach pays out 7.58 (ie a month's line rental) per day of delay in repair (compared in my case with perhaps 30p 'credit'). Not at this stage - compensation would be nice, when one knows what is paid out by Openreach, and in the past I recall having at least 8 months credit from BT (when they added 1 month's credit for every 3 days without service... luckily I had 2 lines and Home Highway so was not totally without service anyway). 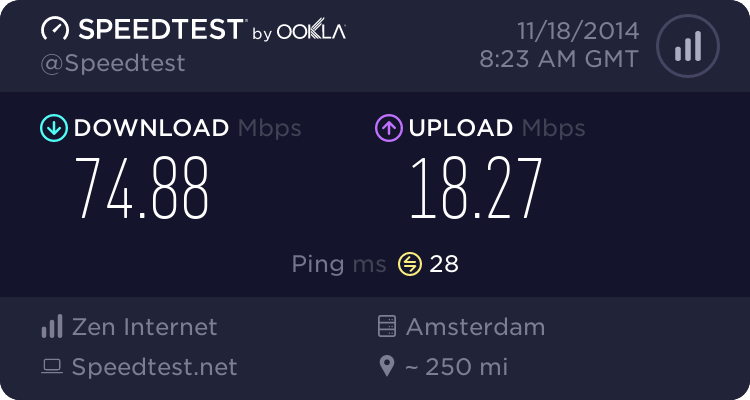 It's a partial non-issue because a second line (my first uses Plus.Net for broadband, with Primus charging 5.99/month line rental) was installed free, and they have given me 6 months free broadband (normal price 8.00/month), while line rental was effectively 10.00/month (I paid for 12 months in advance). I can quite understand the young chap in Customer Services having no knowledge of compensation being paid out, since it would be much higher up where the contract was negotiated, but as I explained to him, I've been following telecom matters for some 30 years. Good news is that they fixed my second line, so by 17:30 both lines were active again. Bad news is that at about 10:30 this morning, my 'first' line (in use for 2+ years, not 2+ months), has lost dialtone and broadband. Two Openreach vans within 200m of home. First was to fix a problem in my street, second was to fix a problem for someone in one of the blocks of flats.